⬅ Just What Are You Missing? After a terrifying accident, a young woman wakes up shackled to a pipe in a basement. Enter John Goodman as Howard who proceeds to tell her of what happened to the outside world. A bombing. Alien invasion. Who knows what really happens but he claims the outside world has been wiped out and he’s here to protect Michelle and Emmett. 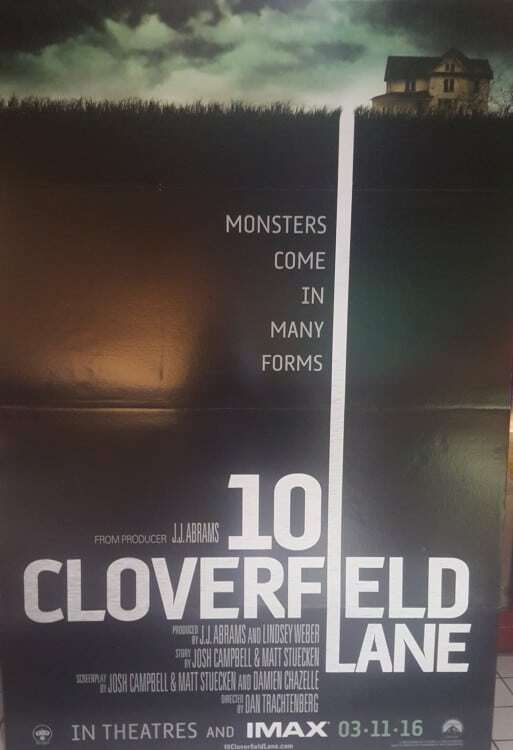 Thus begins 10 Cloverfield Lane, the follow-up to JJ Abrams shaky-cam flick Cloverfield. While not a direct sequel, 10 Cloverfield Lane is considered a blood-relative to the 2008 Cloverfield movie. From that standpoint, the movie doesn’t disappoint. You’re on the edge of your seat from the get-go. Thrills and psychological mayhem ensue. And, as you know with me, leadership lessons can be found buried in 10 Cloverfield Lane. We don’t know the backstory of the characters when we’re first introduced to them. They’re a bit of a mystery and, for the most part, stay that way. When Howard first appeared to Michelle, he tells her something bad had happened to the outside world. His mission: To keep her alive. Howard knew what he wanted to do. He wanted to protect Michelle and keep her alive. That was his goal. Like Howard, leaders need to create a mission that they can buy into. They have to have a purpose to pursue. 2. Progress takes time: We quickly find out what Howard believes happened to the outside world. It was a chemical or nuclear attack by an enemy government. This makes Howard believe that he has to stay underground until the threat has passed and the radiation or pollution has cleared. For him, this could take years. I know many times I want things to happen instantly. I want more impact. I want deeper relationships. I want a project completed. All done yesterday. Instead, progress takes time. We have to be willing to practice and improve while time passes until it’s time. 3. We do things for the right reason but the wrong way: Howard brought Michelle into his survival bunker to keep her safe. He didn’t want her to die outside with the coming attacks. Keeping her safe was the right thing to do. Bringing her against her will and trying to keep her there were the wrong methods. Leaders do this quite often. They have the right reason for doing something but they execute in the wrong way. Be aware of this as you lead. Do the right thing for the right reason. Crazy is building your ark after the has already come. Using a Biblical example, Howard shares why he had built the underground bunker before it was needed. Because if you do it after the fact, it’s too late. Have you been in that boat before? Have you taken action after the fact? Be on the lookout for what the future holds and begin working on things that will help you then, before you need it. 5. Our fear causes us to make mistakes: We discover that the accident Michelle was in was actually caused by Howard as he raced feverishly back home in fear of what was happening. His fear caused an accident. His fear caused him to make mistakes. As we give into our fears, we start to make choices that aren’t good. We slip and fall. We hurt people. If you feel fear creeping in, take note and react accordingly. Howard called on Michelle to do something she didn’t feel qualified to do: Stitch up his wound. She made him aware of it but sutured the wound anyways. We will find ourselves at a point where we don’t feel qualified or know the next step. There will be fear and trepidation. Even in those times, we’re often more able than we think. Yet there’s something wrong with this woman. She has radiation burns. In the end, there’s nothing that could be done for her. We want to save everyone. We want to make everyone better. The truth is that we can’t fix everyone and everything. We can do our part. We can do what we can do to make the world a better place. 8. We hold ourselves back: Emmett reveals that he’s only there because he had been holding himself back. He was scared of leaving the safety of the small town life he’d always known. Does this ring true for you? Have you ever held yourself back? I find myself doing this. I held myself back for years on launching a blog and a podcast. I held myself back in leadership meetings. Stop holding yourself back. You’re not doing yourself or anyone else a favor. 9. Use your strengths: Michelle finally realizes she needs to get out of the underground bunker. Things aren’t right and they’re only going to get worse. What does she do? She played to her strengths. She began to design a hazmat suit that would allow her to survive outside. We all have strengths. Not all of us are using them. Step into your strengths. Embrace them and flourish. 10. Your next thing doesn’t have to look like your first thing: J.J. Abrams was the creator of Cloverfield. A monster movie. 10 Cloverfield Lane is his second movie in this series and it deviates so far from Cloverfield you wouldn’t be able to tell they’re related except they’ve told us this. J.J. Abrams took the chance and allowed his work to evolve and change over time. His new thing doesn’t look like his first thing. Don’t be afraid to step outside of what others expect from you. The work you’ve done before doesn’t have to be the work you do tomorrow. Question: Have you seen 10 Cloverfield Lane? If so, what leadership lessons did you pull from the movie? If not, what was your favorite one that I shared? Let’s talk about it in the comment section below.